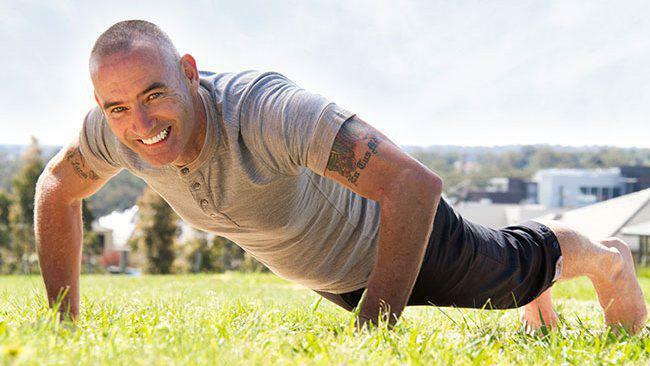 Anthony Field is one of the founding members of “The Wiggles,” the popular children’s television show and world-touring musical group. Entertaining and teaching children is Field’s passion, but the fast pace and physical demands of the job were taking a toll on his health. That’s why Field – and the entire Wiggles group – turned to chiropractic care as a way to improve their health and keep doing what they love to do. Eight years ago, Anthony Field, also known as the “Blue Wiggle” of “The Wiggles,” the most popular and successful children’s performing act out of Australia, was smiling in front of the cameras and the crowds, but grimacing in pain backstage. In those days, Field, now 48, was also overweight and taking daily Valium and anti-inflammatory drugs for pain to get through the day. He said he was depressed and lost. “I was eating poorly, I was slouching and not strengthening my core, and my back gave way and I got into a terrible cycle of pain. I didn’t know any better until chiropractors came into my life,” said Field. Fortunately, Field has never had to return to this low point in his life, thanks to a friend’s tip about trying chiropractic. When Field began experiencing chiropractic care, he said he quickly learned an important lesson that would change the rest of his life: In order to get his health back, he had to allow his body to heal itself. He had no other choice; his job in the Wiggles depended on it. One of the first chiropractors to lead Field to the path of overall wellness was Dr. James Stoxen of Team Doctors in Chicago, who has worked as a chiropractor to the Wiggles since 2004. Dr. Stoxen said that when he first met Field, he appeared on the outside as if he was very happy and healthy, when in reality, Field was at a point of physical meltdown. “Anthony is the leader and spark for the direction of the Wiggles. So at that time, his limitations were the limitations of what level of performance was presented on their television shows and in their live performances,” said Dr. Stoxen. A typical Wiggles concert features the Wiggles dancing and singing along with as many as 3,000 children. Stoxen said he took the time to do a thorough examination of Field and was able to help him find the cause of his pain. Over time, the two worked to begin the healing process, which included preparing a training program to rebuild Field’s body. Field’s journey to transformation included not only regular weekly chiropractic adjustments, but also simple anti-gravity exercises such as using his own body weight for strength training and using his foot muscles more often by walking barefoot. Ever since then, Field has followed the protocol diligently, gaining overall strength in all areas of his life. “When you look back on their previous live performances, they were doing a bit of live dancing. After chiropractic care and the prescribed exercise program I gave them, their shows advanced,” Dr. Stoxen said. Dr. Jeanette Altieri Dr. Jeanette Altieri is a licensed Chiropractor serving the Lawrenceville community for more than 20 years.She is certified in the Webster technique, a safe and gentle technique for turning breech babies, with specialty areas in Nutrition, Pediatrics, and Pregnancy. She is an international speaker, speaking to chiropractors, their families and staff about the care of infants, children, pregnancy and motivation. She also co-hosted a local radio talk show, “Health Talk,” to help educate people on the benefits of alternative therapies and wellness. What began in 1992 as a chiropractic care facility has evolved into today’s integrated wellness center. What would you do if you were diagnosed with cancer and the “best” treatment option doctors could offer was chemotherapy? Most people do not believe that regular chiropractic adjustments can save their life. But, Robbie Meeks certainly does. AC Spine & Wellness patient, Anthony R. Socci (Tony), is living proof that it is never too late to live a healthier life. Here are just a few of the ways you can find natural relief from this herbal remedy. 10 Foods Banned in other Countries and Consumed by Americans EVERY DAY! How many of these foods, which are banned in many other countries, including Europe and Canada, are you and your family consuming on a regular basis?